Cardi B and Offset have expanded their family! On Wednesday, July 11, 2018, the "Bodak Yellow" rapper, whose real name is Belcalis Almanzar, took to Instagram to reveal that she and husband Offset (real name Kiari Cephus) have welcomed their first child together, a baby girl. "Kulture Kiari Cephus 07/10/18🎀🌸 @offsetyrn," the new mom simply captioned a gorgeous snapshot of herself showing off her baby bump. At the time of this writing, the Migos rapper, who is already a dad to three young children from previous relationships, has yet to publicly comment on their child's birth. As Nicki Swift previously reported, Cardi B, 25, confirmed she was expecting her first child in April 2018 by putting her baby bump on full display during her musical guest appearance on Saturday Night Live. The big reveal followed months of pregnancy speculation. "I really did want to hide my pregnancy, because I just hate people's opinions," the "Finesse" rapper later said during an interview on the Big Boy's Neighborhood radio show. "I hate different opinions and I hate people talking down about my baby, making it seem like it's not a blessing." This wasn't the first time the married pair understandably decided to keep some parts of their relationship private. 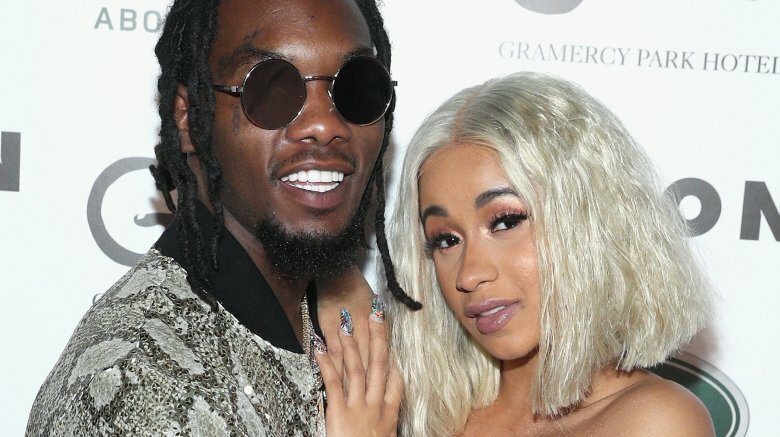 Offset, 26, publicly proposed to Cardi B last October while on stage at a concert in Philadelphia. However, it was only revealed in late June 2018 that the two had already tied the knot weeks before announcing their engagement. "There are so many moments that I share with the world and then there are moments that I want to keep for myself! Getting married was one of those moments!" Cardi B tweeted once the news broke, explaining that her husband had wanted to give her a dream proposal following their small, impromptu wedding. She added, "Well now since you lil [nosy] f**ks know at least ya can stop saying I had a baby out of wedlock." Cardi B and Offset aren't the only celeb couple to recently share exciting baby news. In June, Fixer Upper alums Chip and Joanna Gaines welcomed their fifth child together, while former Desperate Housewives star Eva Longoria became a mom for the first time.